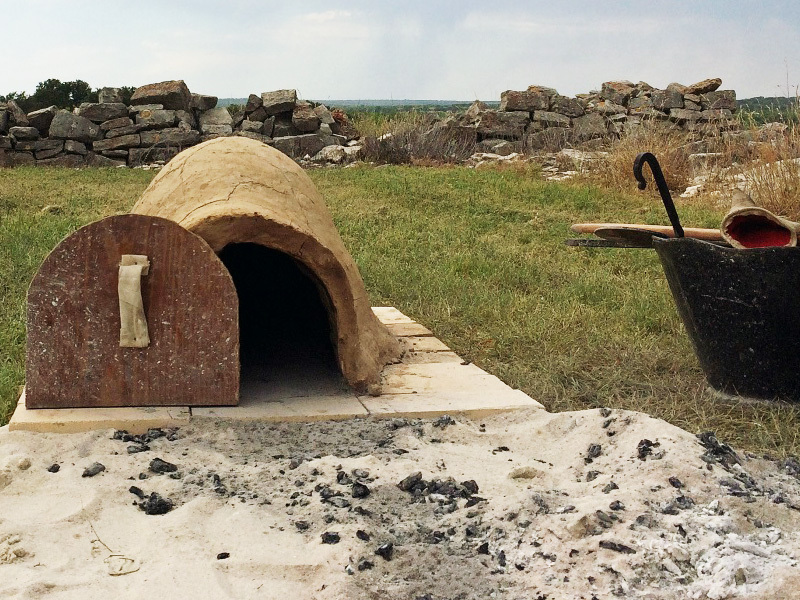 Tejanos and European immigrants in Texas used outdoor earthen ovens to bake a variety of foods. Brandon Aniol, Landmark Inn’s site educator and Emiliano, ‘Nano’ Calderon, Casa Navarro’s site educator, set out to successfully build and operate an horno (a mud/adobe-built outdoor oven used by American Indians and early settlers of North America) using only the technology available in the mid-19th century. The endeavor proved both challenging and delicious! The process begins by making adobe (a type of brick made from a mixture of mud and straw dried by the sun). A mix of topsoil and caliche (a naturally occurring cement-like soil found in Texas and elsewhere) is screened to remove course material and added to a basin filled with water, lime, and hay. The ingredients are mixed thoroughly until they take on a thick, clay-like texture and become pliable. 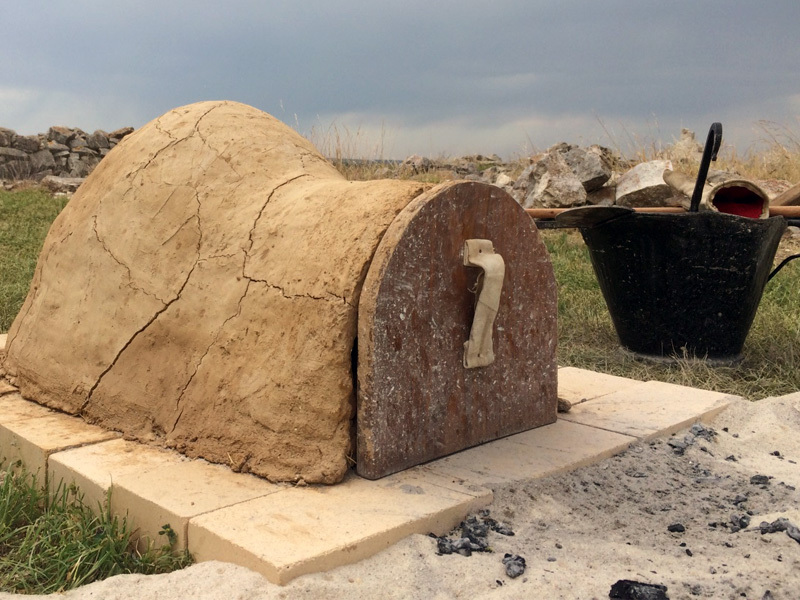 Meanwhile, wet sand is piled into the shape of an earthen oven with careful attention paid to the height and width of the oven’s dome. This is integral to building an oven that will have adequate air flow and space for cooking with live coals. Once the sand is properly shaped, wet newsprint is layered over the sand to create a barrier. The adobe is applied in two layers of one to two inches thick. The first layer needs to air dry for one hour before being scored, and the second layer applied on top of it. Scoring (making scratches in) the dried adobe helps the next layer of wet adobe stick to it. Leftover adobe is saved in case it’s needed later. A small hole is left at the top of the oven’s dome to create a current that draws air through the oven. Likewise, a doorway supported by bricks and sand is made for the pre-constructed wood door. At this point, the oven is allowed to sit overnight to dry and cure. Adobe drying time is largely contingent upon the weather. Cooler temperatures and shade will increase drying time, while hot sun and wind will enable the adobe to dry quicker but with more cracking. At the beginning of the second day, the adobe oven is inspected for cracks. The oven may not be completely cured, but dry enough on the outside to hold its shape. Any visible cracks are patched using leftover adobe from the day before. Sand used to make the adobe oven’s form is removed through the door, leaving the dome hollowed out and ready for use as an oven. With a bit of practice, anyone can bake in an horno because all it requires is time and patience. It may be helpful to invest in a bellows or blow tube to inject air into the oven through the door or the opening in the top. Carefully push the fire back toward the inner dome where it will reduce to coals. Continuing to feed the fire with small pieces of dry wood will gradually increase the temperature, preventing the adobe from cracking and releasing heat. Place your hand over the top of the dome to gain a feel for the radiant heat within. The oven is ready to use when you are able to hold your hand to the back of the oven for no more than three seconds. While the oven heats, it is time to prepare the bread dough. European immigrants in Texas were accustomed to leavening with yeast, and often traveled with yeast starters for baking. The Texas heat causes the dough to rise double what it would in your home kitchen. It is often necessary to half or even quarter the dough to accommodate the size of a small horno. Although multiple methods can be used to bake in the adobe oven, the following approach produces a great loaf. Place the dough ball on a small stoneware plate slightly smaller than your oven door opening. It is essential that you do not stoke the fire after this point, as blowing air into the oven will cover your bread with ash. After about 45 minutes, your bread will be done baking when the outer crust appears brown and flakey. 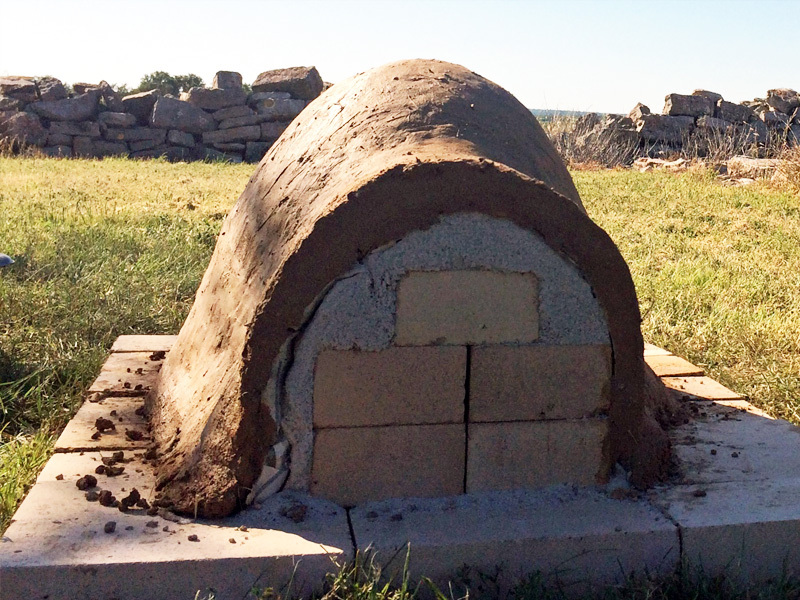 Tejanos followed these same steps to bake in outdoor adobe ovens for centuries. European immigrants used similar ovens in their homelands and were already familiar with the technology. As many Texas families break bread over their dinner tables each night, remember that something so simple was not always so easy. Bread is a connection to Texans past and present, no matter your ancestry. 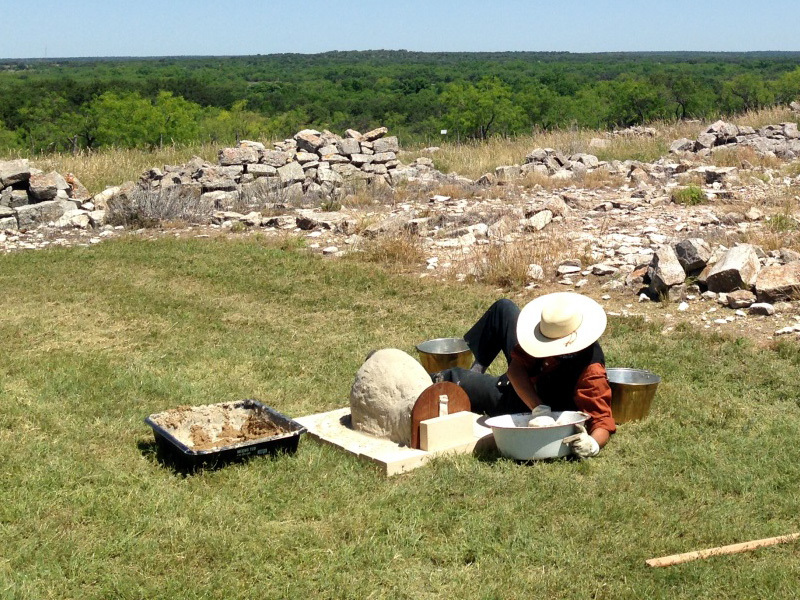 Emiliano ‘Nano’ Calderon building the sand form for an adobe oven at Fort McKavett State Historic Site.